The Douglas fir is a giant tree, that can reach a height of 100 metres in its country of origin, the United States, and heights of up to 50 metres in Europe. This tree (Pseudotsuga menziesii), from the Pinaceae family, is also called the "Oregon pine" or "Douglas spruce" depending on the region. The Douglas fir has a characteristic structure, with staggered branches at the base that are often raised at their ends. Its bark is smooth, pustular and cracks with age. Its evergreen needles measure 2 to 3 centimetres in length and have two white stripes on their lower side. Flexible, they are fixed to the branches by an oval cushion. These leaves have a lifespan of about five years and produce a lemon grass smell when bruised. This is a monoecious tree, with round and yellowish male flowers and more elongated female flowers that are greenish and purplish. Its cones are 8 centimetres long and mature in October. They hang down and measure between 6 and 10 centimetres, with the particular characteristic of 3-pointed, prominent bracts applied on the scales. This species grows all along the Pacific coast of North America, from Canada to Mexico. In the Rocky Mountains of the United States, a botanist named Archibald Menzies discovered this species in 1792 during a scientific expedition. It was introduced into Europe a few years later by a British scholar, David Douglas. 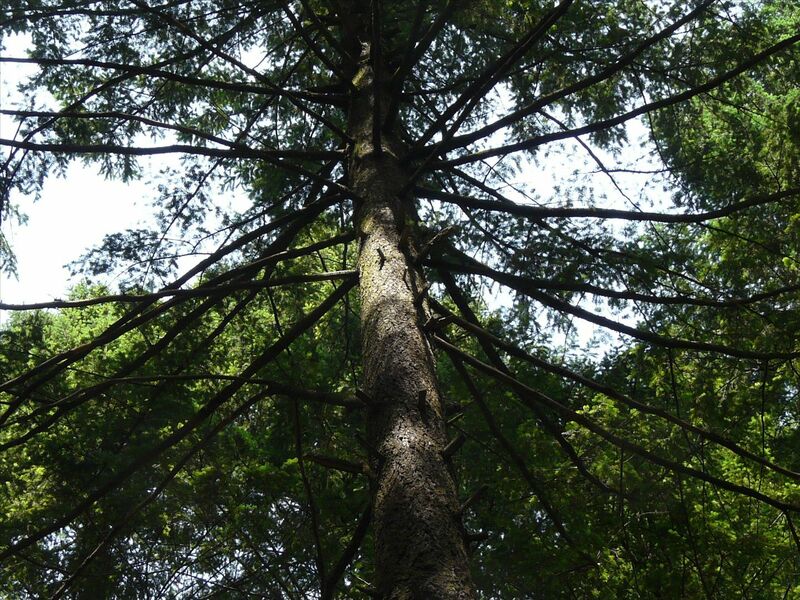 The Douglas fir is a tree species that tolerates summer droughts and very cold winter weather. It does well in acidic, deep and light soil and requires well-drained and quite cool soil. First introduced as an ornamental tree, this species above all is a source of heavy and durable wood, used in construction and joinery, especially for transformation into plywood.